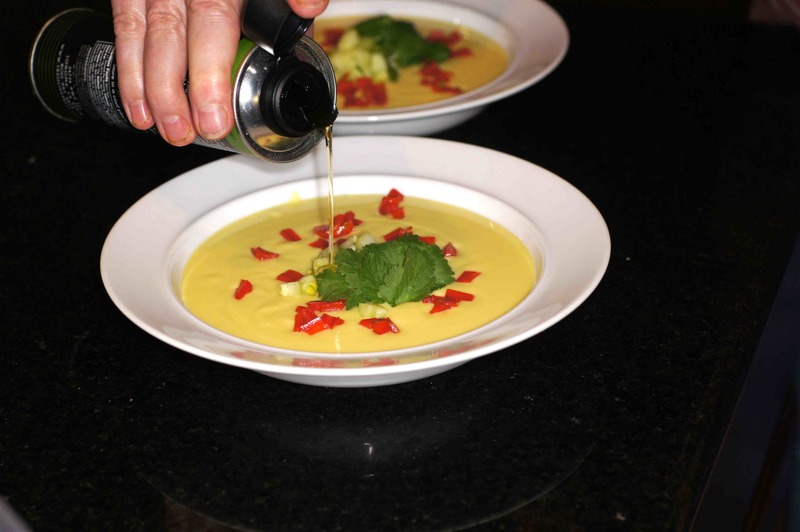 If you’re looking for a cool, refreshing, tasty summer soup you need look no further. 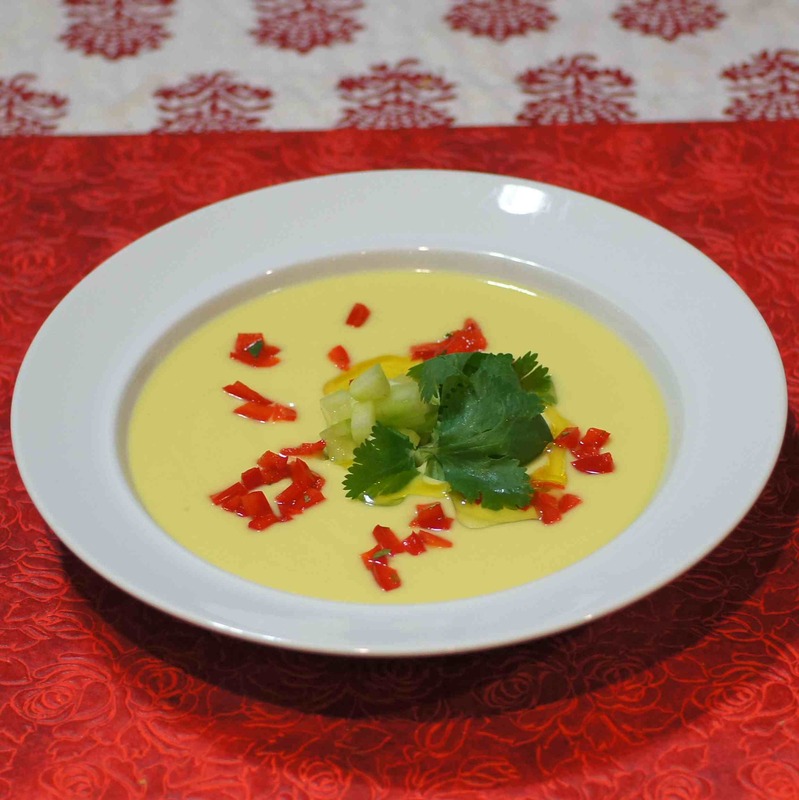 Courtesy of Chef Mimi Blog, we bring you Pineapple Gazpacho. 🙂 Whoa Nellie!!! You really need to try this soup! Like the rest of us, we typically browse around blogsphere looking for interesting posts, pictures and recipes. There are lots of recipes we find that we bookmark for later reference either because of the recipe or technique involved. Many of the pictures/recipes serve as an inspiration or starting point for a new recipe. Others catch our attention to try at a later date. Very seldom do we find recipes that scream “Make me now!! !” This is one of those recipes. You see, I love cold soups in the summertime. They are so very nice, bright, cool and refreshing. When you see as much 100+ F heat as we do in the summertime, you need something nice, bright and refreshing. 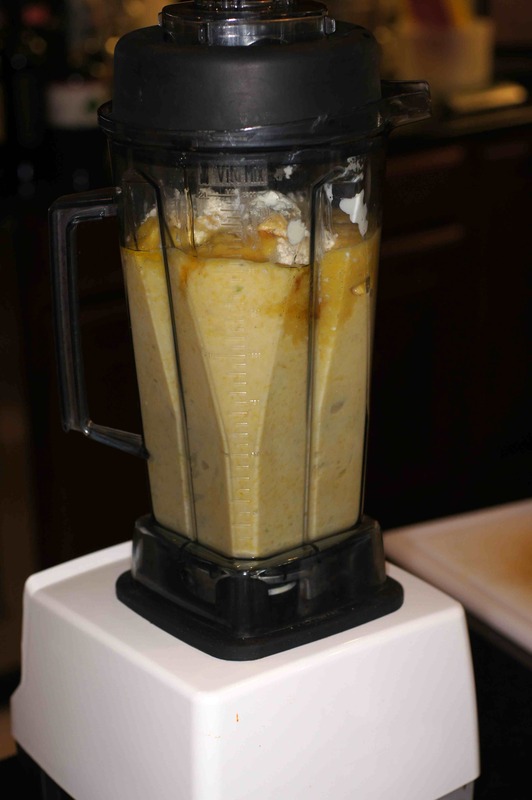 As I was wandering through blogsphere this past May, Mimi posted a recipe for a pineapple gazpacho she helped prepare on a trip to St. Lucia in the Caribbean. Now, Mimi is a fabulous cook. Besides feeding her family, she has owned and operated her own catering company, worked as a private chef, was a food editor and recipe developer, taught cooking classes, had her own cooking show and is a cookbook author. Obviously, she knows her way around a kitchen, both a commercial kitchen and a home kitchen. 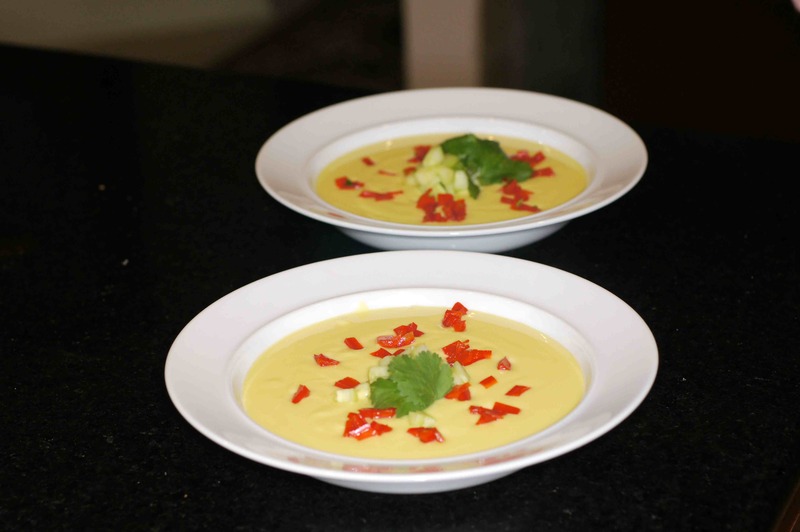 Given I love cold soups and fruit gazpachos, Mimi’s recipe grabbed my attention. The flavor profile was killer and it was a beautiful soup, to boot. I just had to make it. So, I immediately went to the market and bought a pineapple. It wasn’t quite ripe so I left it out on our kitchen island to ripen with the full intention of making the soup in a couple of days. 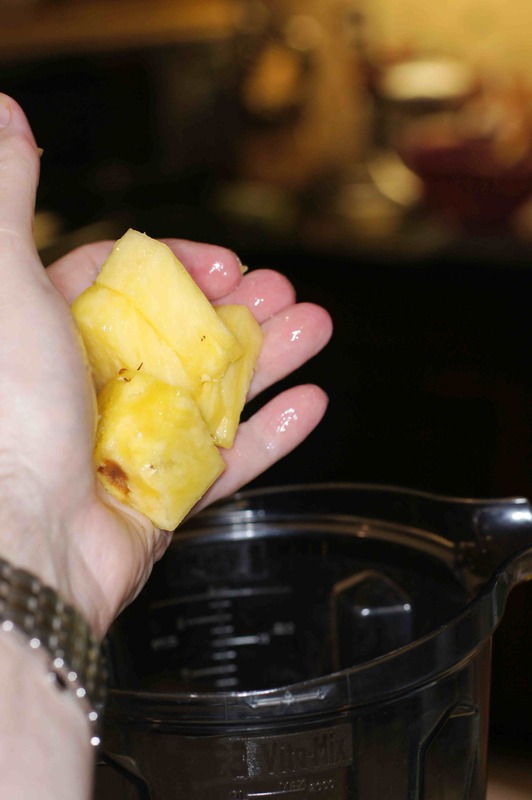 Unfortunately, as it sometimes happens, life got in the way and by the time I was ready to make the soup (about a week later) the pineapple spoiled. 😦 Not to be deterred, I went and bought another pineapple. Baby Lady patiently left the pineapple alone even though I let the first one spoil and she very much wanted to use it for her lunch inasmuch as she loves pineapple. Hrmph!! Once again, I had other matters come up, didn’t fix the soup and the pineapple went bad. 😦 😦 Now, not only had I let 2 pineapples spoil but I deprived Baby Lady of one of her favorite fruits. Boy had I made a big mistake. So, when I bought the 3rd pineapple, Baby Lady gave me 3 days to make the soup or she was going to eat the pineapple by herself. 😮 Obviously, I needed a little motivation. So, last week, I finally got around to making this lovely soup. 🙂 It was the appetizer for a night in the Caribbean theme dinner and it was absolutely delicious! 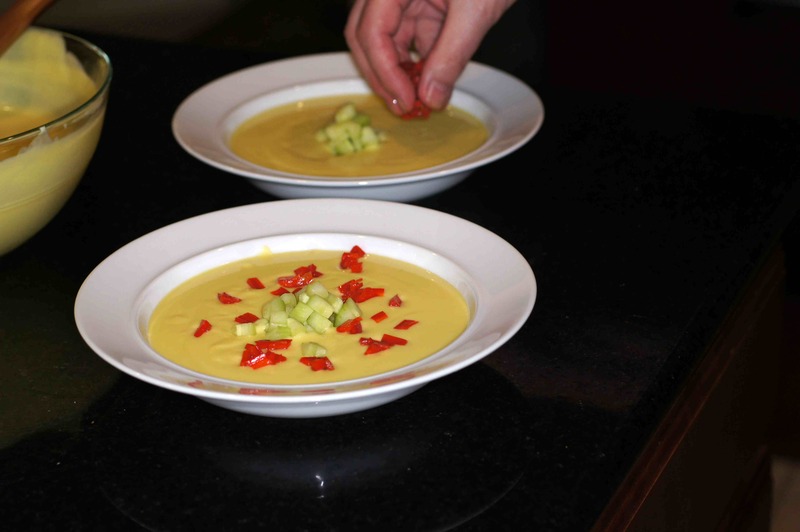 Our soup is ever so slightly modified with the addition of beautiful pickled red peppers. 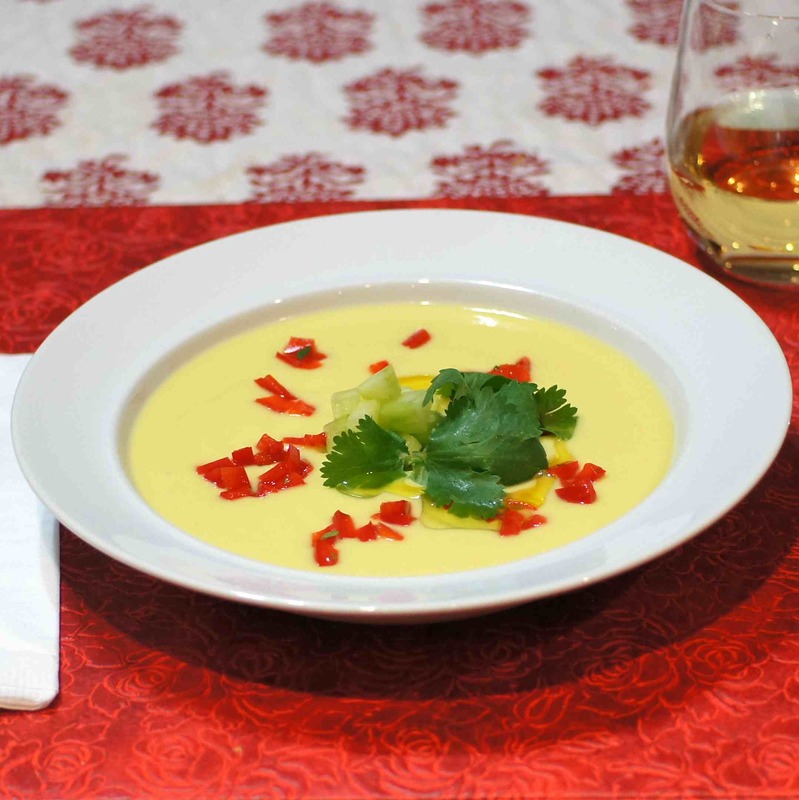 They served as a perfect contrast to the smooth, soothing creaminess of the gazpacho. You really need to try this recipe. Thanks, Mimi. For the Pickled Red Peppers. 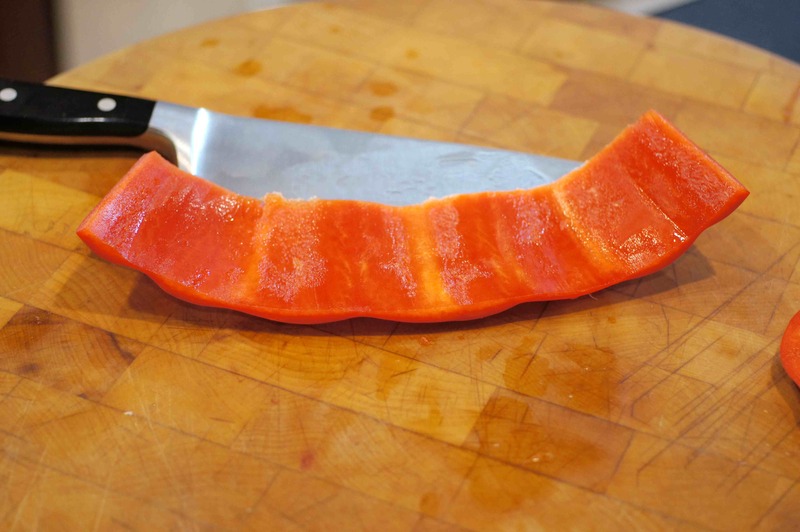 Cut the top and bottom off the red bell pepper, core it and slice one side so it will lay out flat. Now lay the pepper out flat on the cutting board. 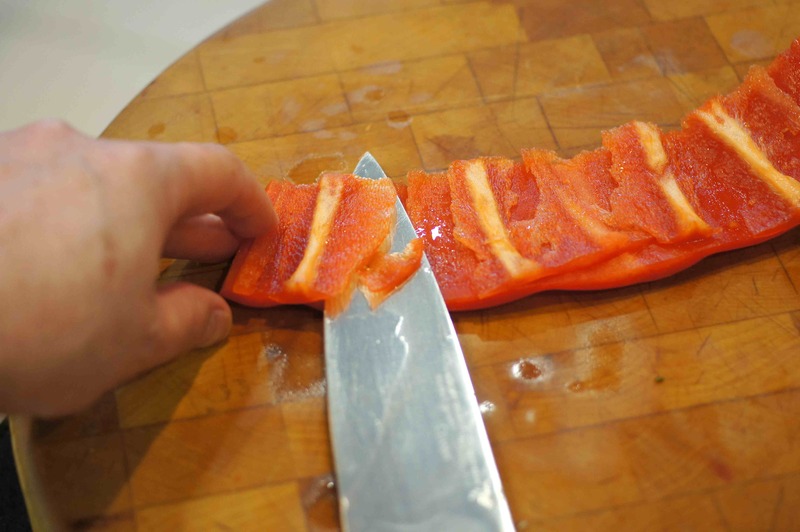 Using your knife, very carefully, cut a small sliver of the red pepper passing under the ribbing of the pepper. 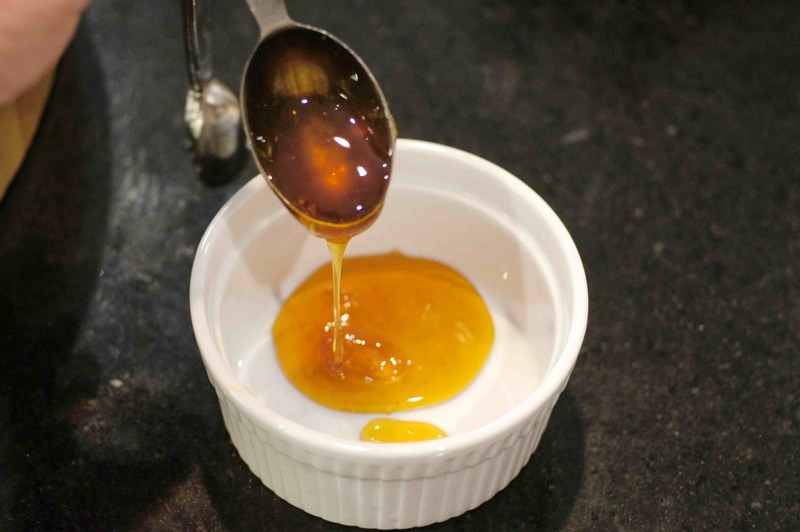 Add 1 Tbsp honey to a small container. 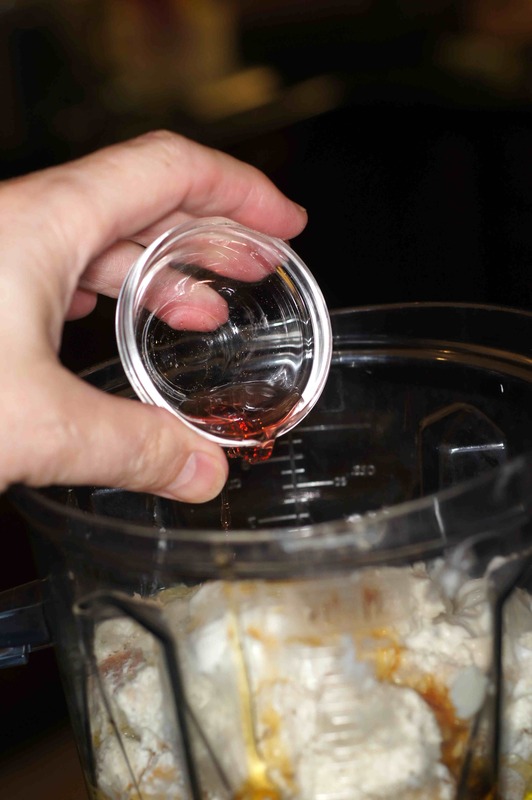 Now, add 2 Tbsp vinegar and 2 Tbsp water. 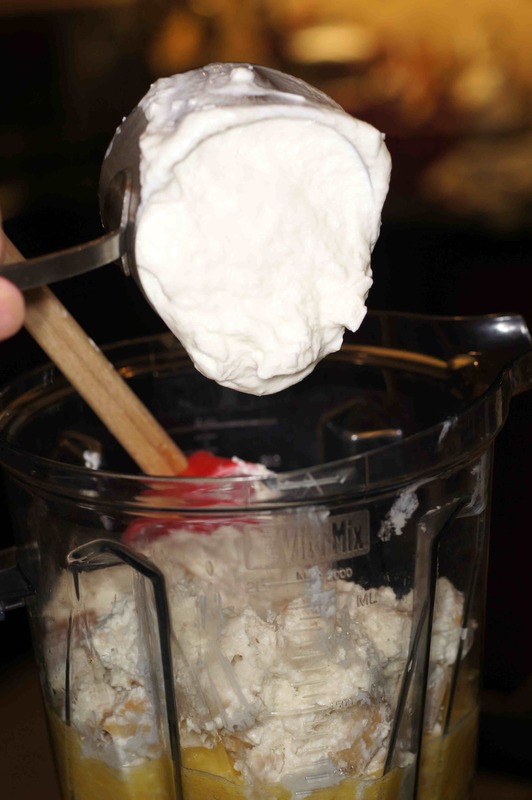 Whisk to incorporate and add julienned red peppers. Cover, put in refrigerator and let sit for at least 2 hours. 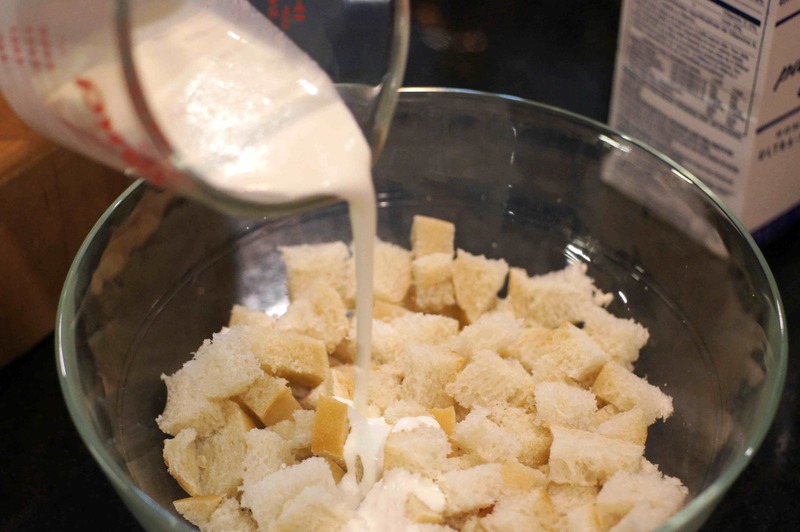 Cube bread, place in a bowl and pour cream over bread. 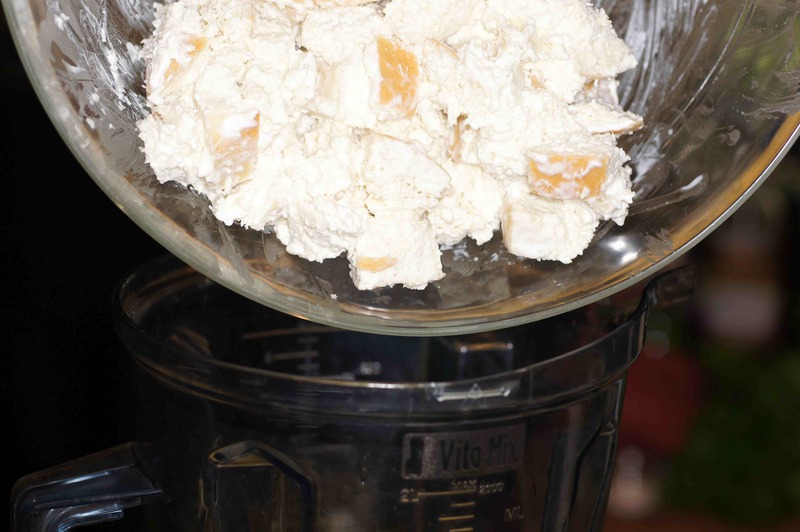 Toss to mix cream and bread together and set aside until needed. 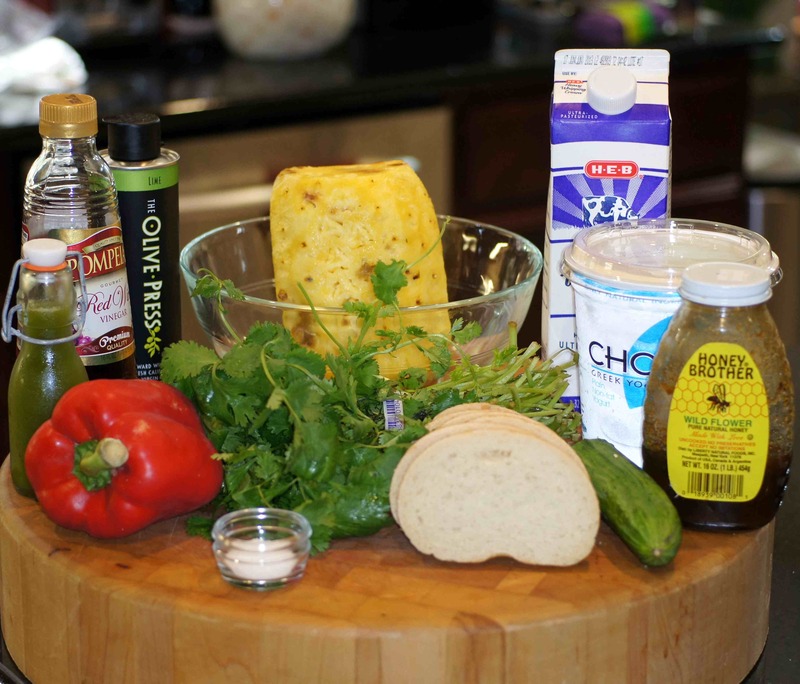 Now, add chopped pineapple to Vitamix or large blender. 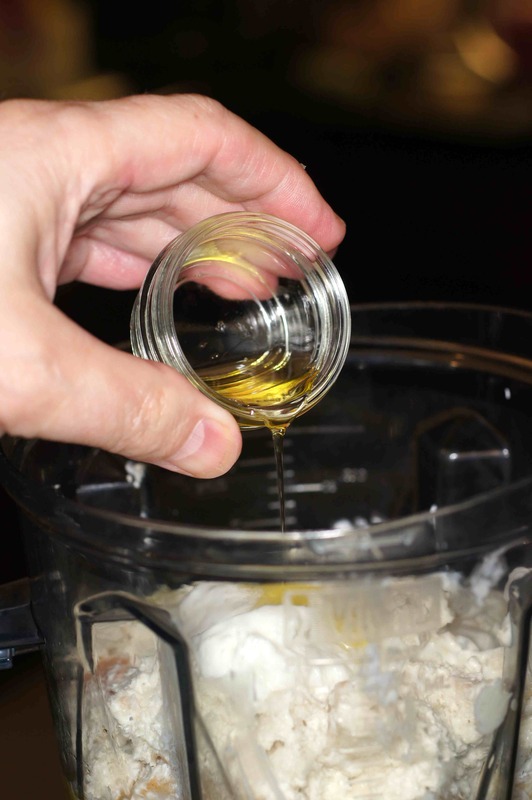 Blend for 30 seconds on highest speed. 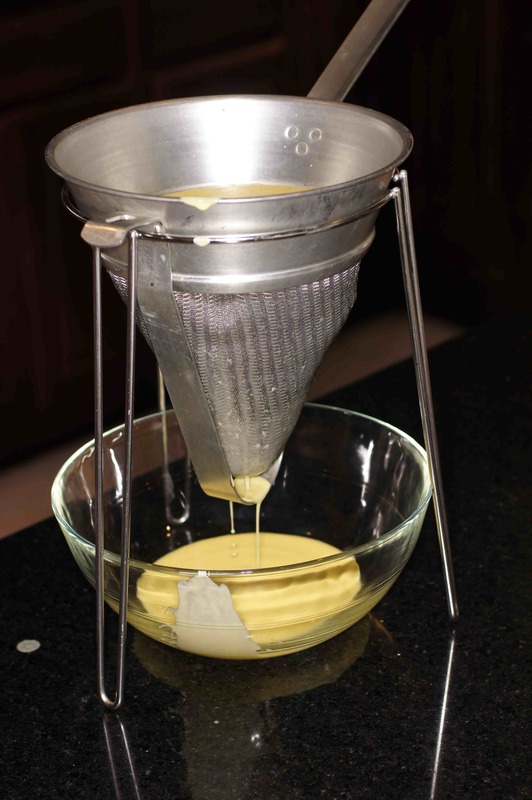 Strain through a very fine mesh sieve or a chinois. Cover with plastic wrap and refrigerate until cold, roughly 2 hours or so. 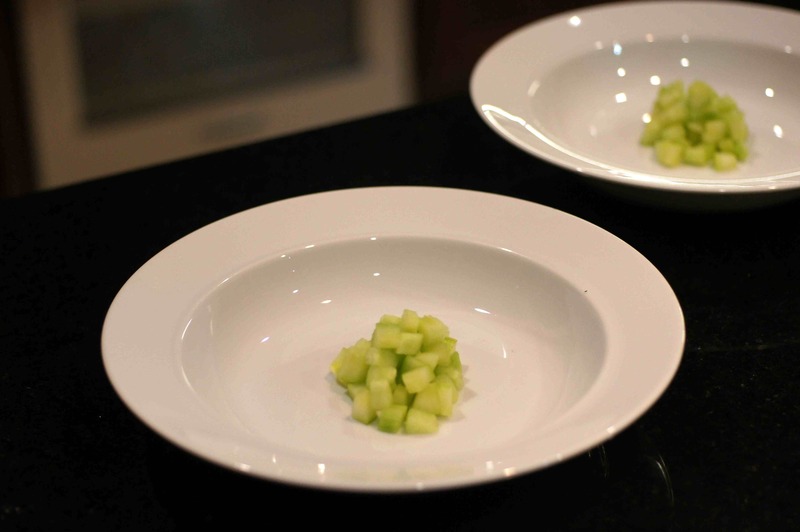 Place some diced cucumber in the middle of a bowl. Serve & enjoy!! We most certainly did. 🙂 Thanks again, Mimi. I’ve got some pineapple, this sure does sound like a wonderful summer soup. Very nice! I’m going to make it this week for sure! Hi, Eva. Thanks for the nice compliment. If you do make it, let us know what you think. I got vetoed, sadly, it’s a flavour I would have liked to enjoy for sure! Excellent! I will try this recipe. What kind of hot sauce is that, Richard? It looks green! Hi, Mimi. 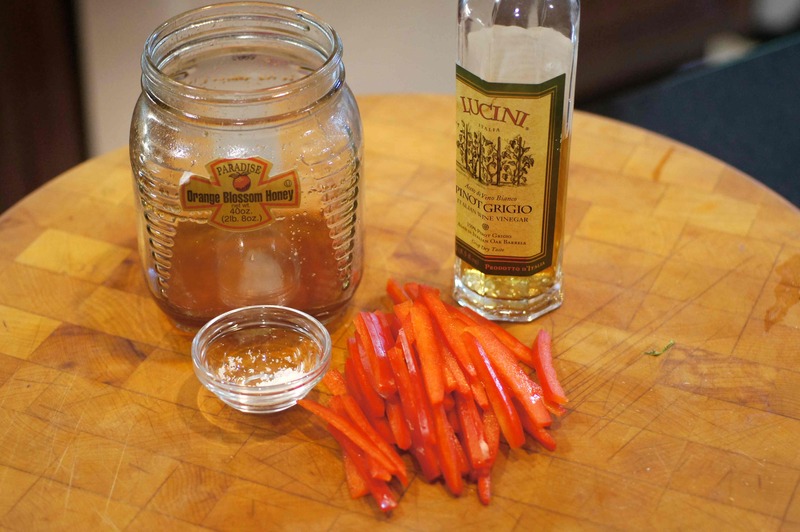 Last year I got hooked on making my own hot sauce. This was the third batch of hot sauce at the end of the growing season when I harvested all of the green cayenne chiles and some hot Hungarian chiles I knew would not ripen to a red color. 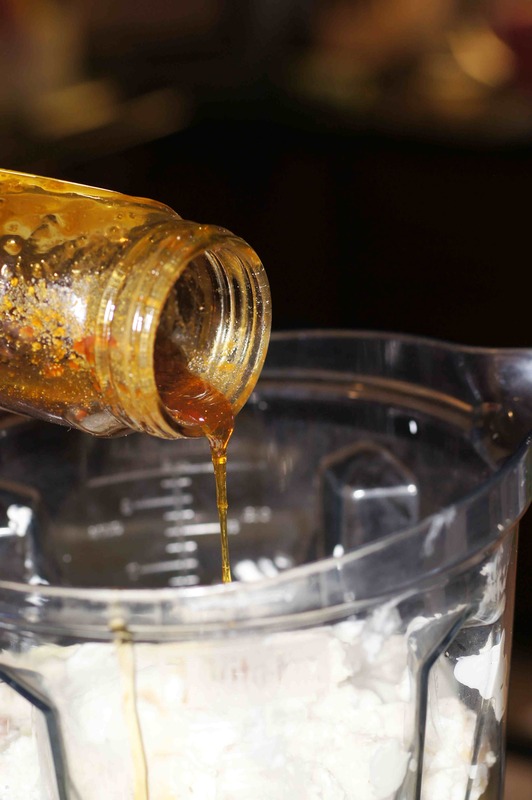 It has incredible flavor and has gotten a little hotter as it sat in the fridge. 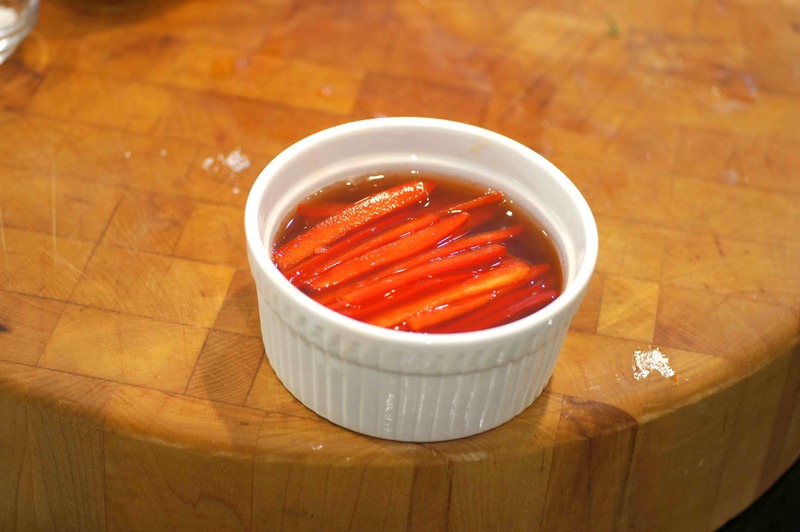 You can find the recipe at https://remcooks.com/2012/09/30/hot-pickled-pepper-sauce/. It’s after the first recipe as a variation. I also corrected the ingredient list to provide a link. 🙂 This soup was absolutely killer. We enjoyed it tremendously. Thanks, again. Looks great, Richard! I already decided I’d try this as soon as we have summer weather here when I saw Mimi’s post, and now I am even more determined. I just wish that summer would be as determined 😉 Love the pineapple story! Wow, this looks fabulous. What are the bread crumbs doing in the soup, though? 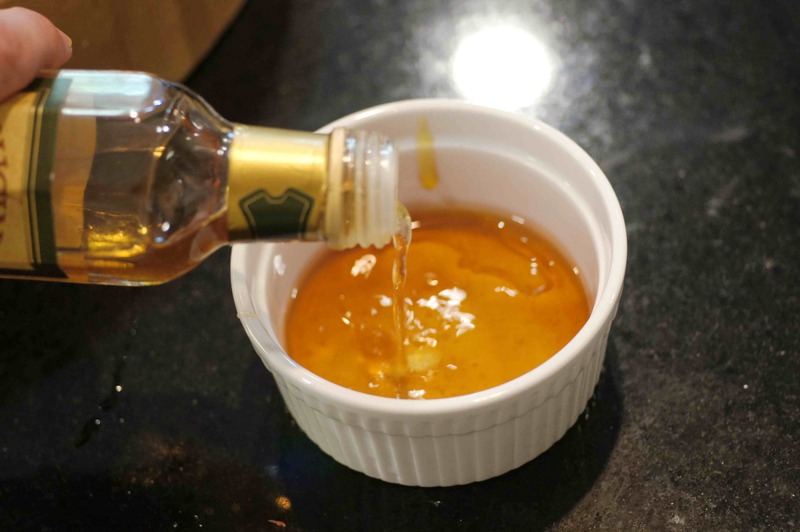 I’ve never seen that done before… I recently wrote about the wonderful properties of pineapple (not to mention its great taste) and would like to try this . But BREAD? Thanks, Sharon. It’s a wonderfully flavorful soup. I didn’t understand the bread crumbs either but it was not my recipe so I wanted to try it without any modification first. I had never seen this technique in a cold soup either. 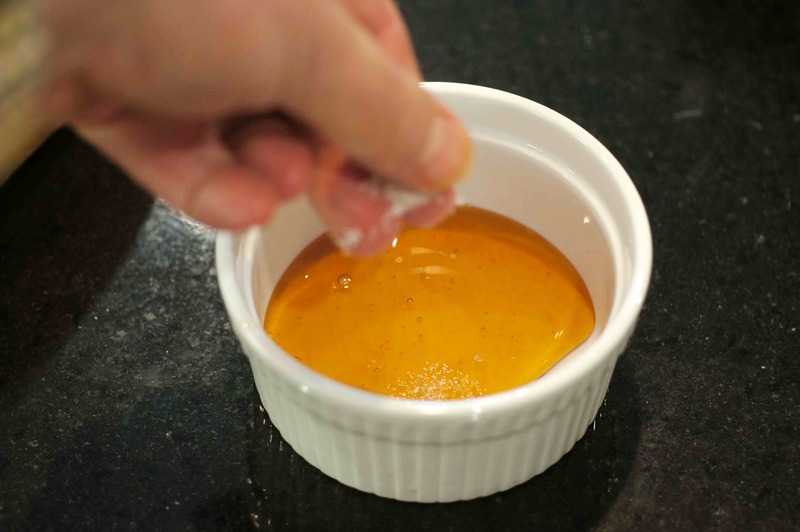 I have seen it in hot soups and sauces as it acts as a thickening agent because the flour cooks out much like a roux. So I was intrigued by the cream soaked bread. The bread added thickness to the soup (perhaps a little much) and some flavor. 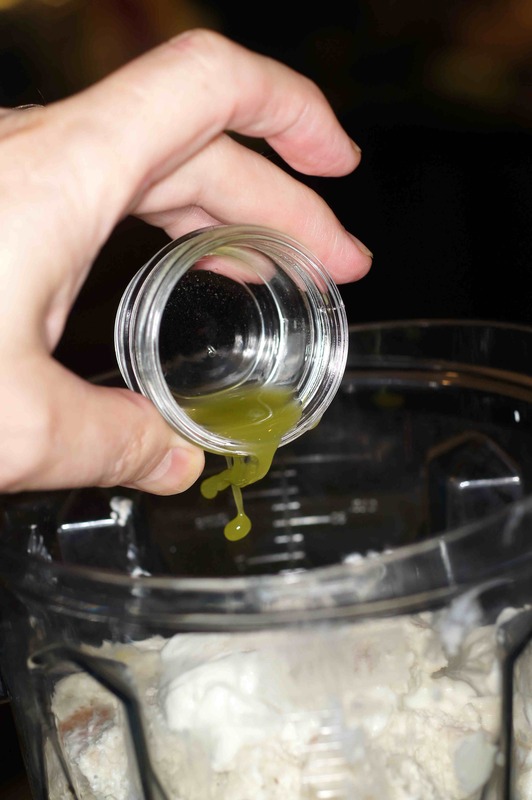 Along with the cream, it mellows the pineapple. Try it and let me know what you think. Tried this on the weekend, in my usual vinniesque way, with mixed results. 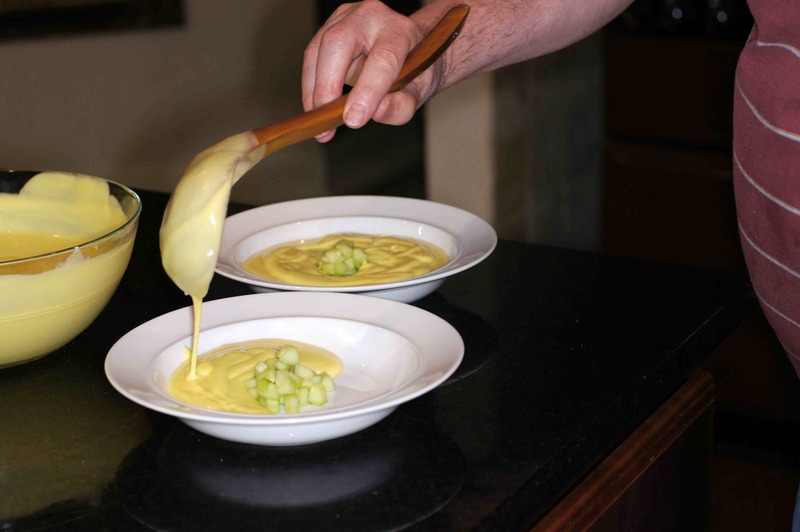 At first blush, after I had strained the puree and tasted, my impression was: Delicious! 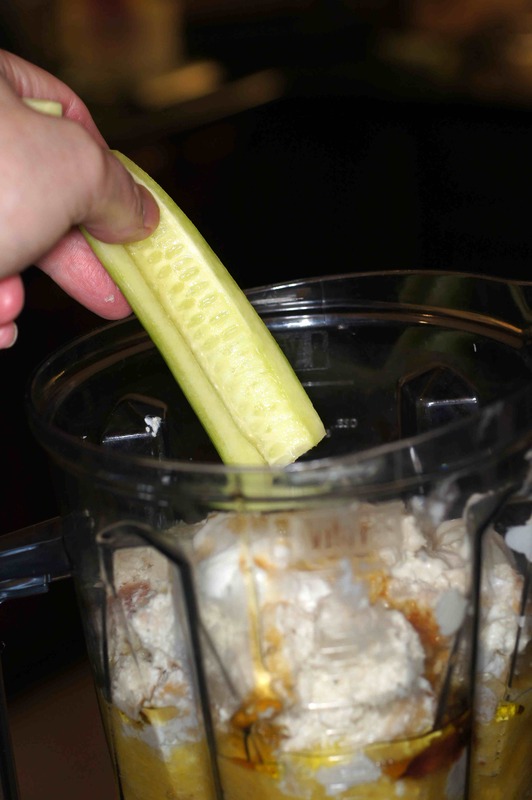 Then rereading the recipe I saw I had forgotten an ingredient, the small cucumber. 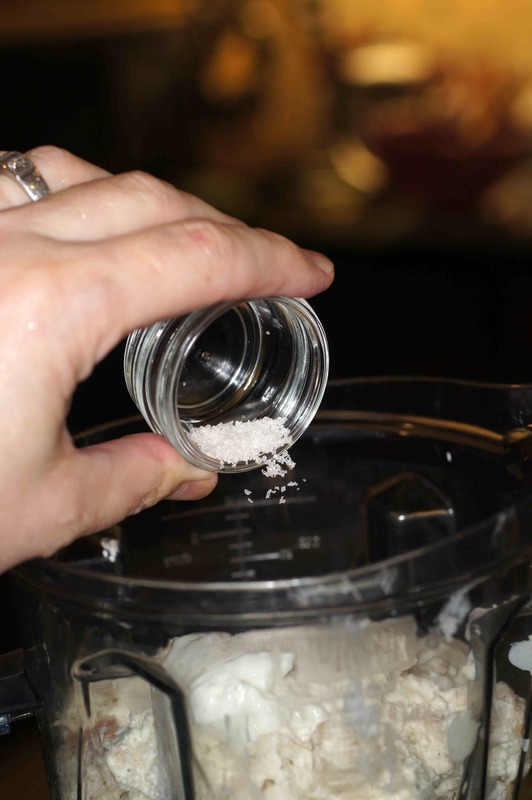 I tossed the whole thing into my blender, strained out the skin and seeds and added it to soup pot. The cucumber flavor came through but it was still ok and I put it in the fridge. At serving time, I tasted before serving and argh! The soup was bitter as heck from cucumber skin! This morning I added another secret ingredient, and the soup was back to tasting delicious. Next time I’ll leave out the cucumber or at the very least peel and deseed it to an inch of its life. Will be posting about this experiment in September 🙂 Thanks for the recipe idea! Please fix the typos if you decide to post the above comment?